© 2002, © 2018 by Paul Freeman. Revised 7/7/18. 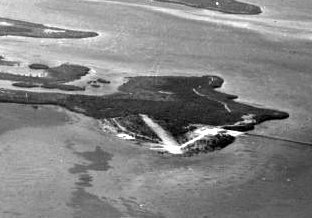 A September 1952 aerial view by Edwin Swift looking northeast at “Ed Barry's Airstrip & No-Name Fish Camp on Big Pine Key” (courtesy of Tony Daiuto). The fish camp evidently included an airfield. 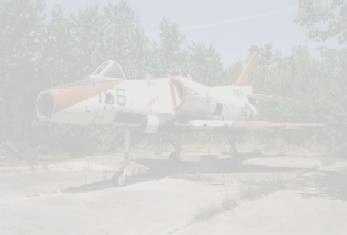 which depicted a single unpaved northwest/southeast runway to the west of the “No-Name Fish Camp on Big Pine Key”. An April 1954 aerial view by Edwin Swift looking northwest at Ed Barry's Airstrip (courtesy of Tony Daiuto). 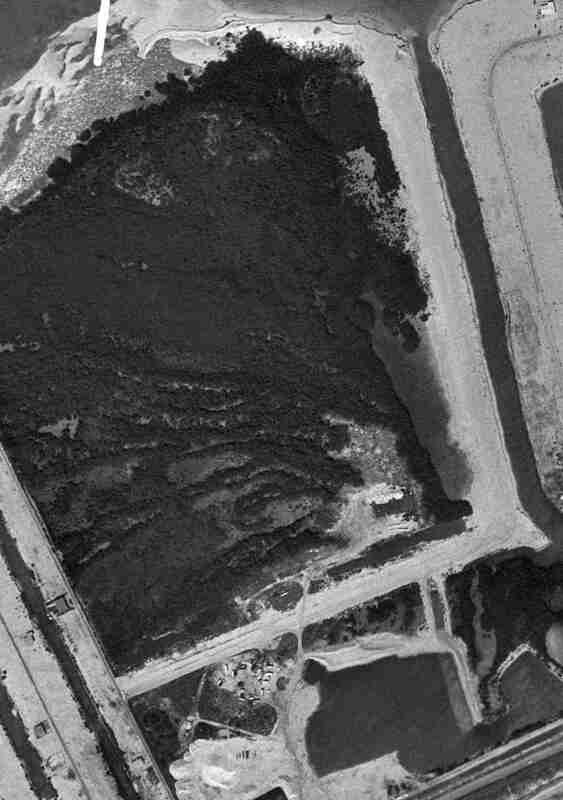 as a 1970 USGS aerial view showed canals & houses having been built on the site, with no trace remaining of the airfield. A 2017 aerial view looking north shows no trace remaining of Ed Barry's Airstrip, but the buildings of the No-Name Fish Camp seen in the 1952 photo still remain (at top-center of the photo). Thanks to Tony Daiuto for pointing out this airfield. 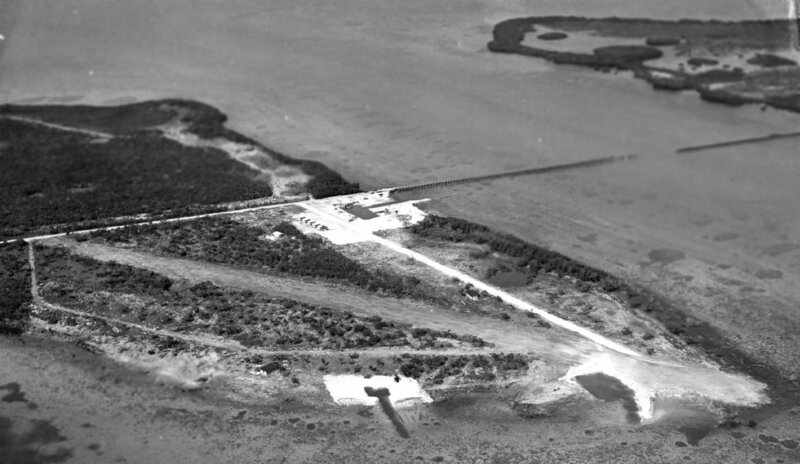 A 2/21/59 FL DOT aerial view of Matecumbe Key Airport (courtesy of David Henderson). 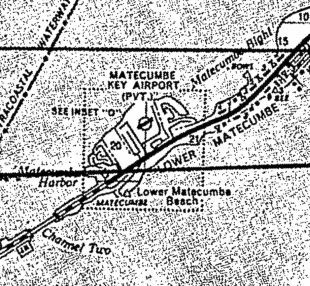 Matecumbe Key Airport was not yet depicted on the 1956 FL Aeronautical Chart (courtesy of Roger Connor). a private field on Lower Matecumbe near Islamorada. without any knowledge that it had once been an airport. According to the Keys History Museum, the land had been owned by Alonzo Cothron who used the property to dredge & sell fill in the late 1950s. The airport had 2 runways laid out in an L-shape. 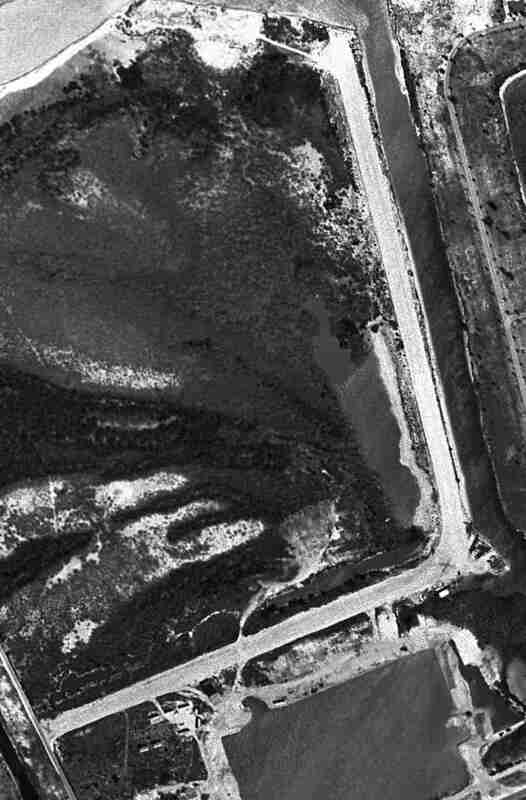 The earliest photo which has been located of Matecumbe Key Airport was a 2/21/59 FL DOT aerial view (courtesy of David Henderson). 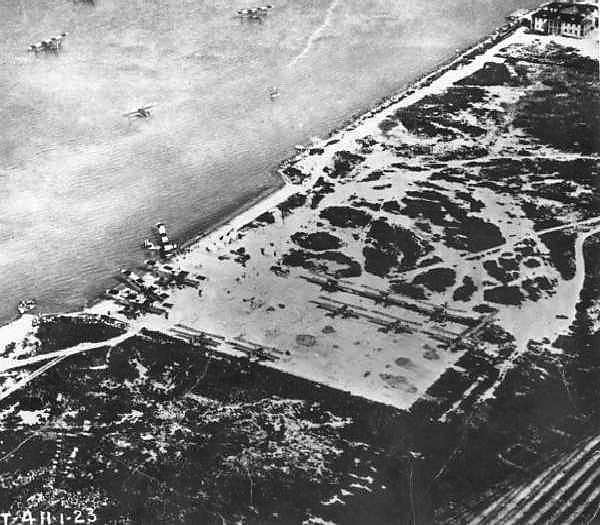 It depicted Matecumbe Key Airport as having 2 unpaved runways, with 3 single-engine planes visible parked on the field. A 3/31/64 aerial view of Matecumbe Key Airport (courtesy of David Henderson). was a circa 1964-70 aerial view looking northwest (courtesy of Loralea Carrera via Jerry Wilkinson). which depicted Matecumbe Key as a private airport. According to David Henderson, “By 1971, construction had begun on the Port Antigua development & canals had been dredged across parts of the former runways. 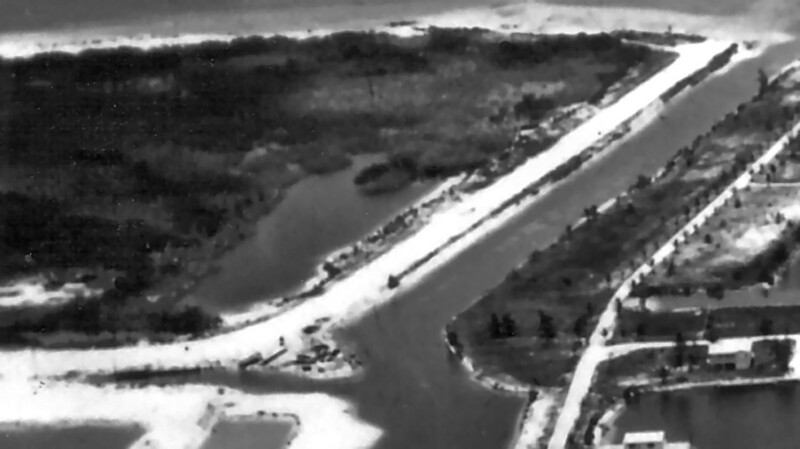 The north/south runway later became Biscayne Boulevard & the east/west runway became El Capitan Drive. 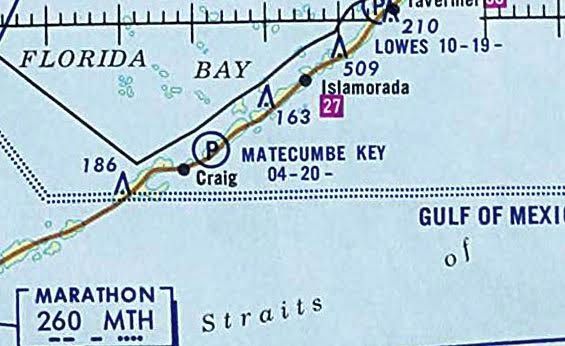 Matecumbe Key Airport was not depicted at all on the 1971 USGS topo map. A 2012 aerial photo (courtesy of David Henderson) no trace remaining of Matecumbe Key Airport. The site of Matecumbe Key Airport is located northeast of the intersection of El Capitan Drive & Gulfview Drive. Thanks to David Henderson for pointing out this airfield. A 2/10/71 aerial view of Port Largo Airport, perhaps while it was still under construction (courtesy of David Henderson). was little more than a breakwater with a runway on top & operated for little more than a decade. Despite its diminutive size, Port Largo enjoyed commercial commuter airline service & became the center of a nearly two decade legal battle. 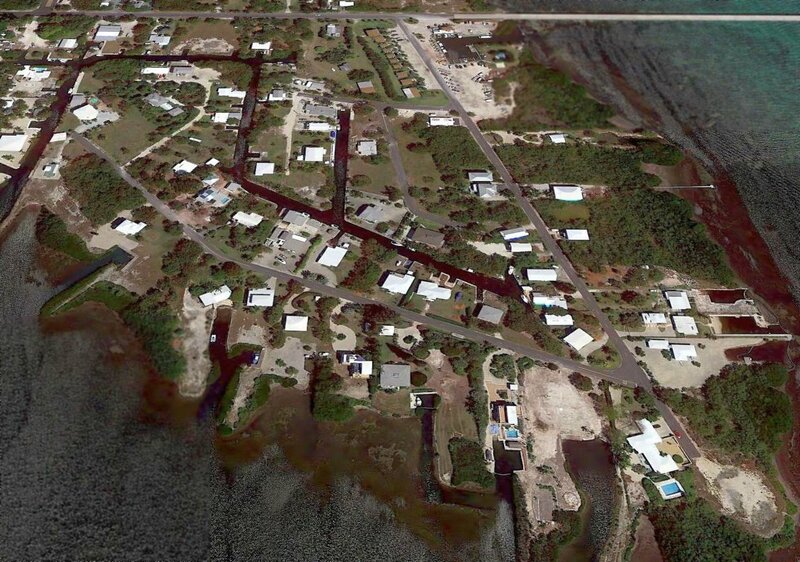 with an undeveloped, submerged parcel of land owned by the State of FL on the Atlantic side of Key Largo. The State sold the parcel to a developer who dredged the area & constructed a breakwater that was paved with a 2,300' landing strip. It was agreed that the developer would eventually donate the property to Monroe County for use as a public airport. which depicted a single northeast/southwest runway directly along the Atlantic. The 1970 USGS topo map depicted the land of the runway, but did not label it as an airport. but with a single light plane visible inland of the north runway end. 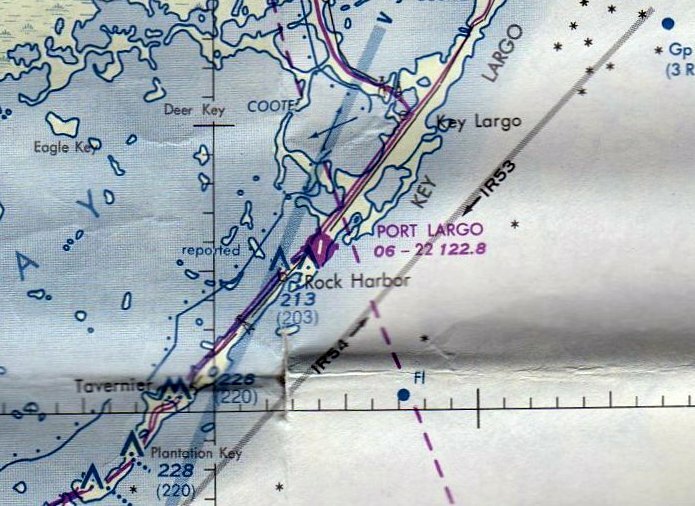 Port Largo Airport was not depicted at all on the 1973 USGS topo map. 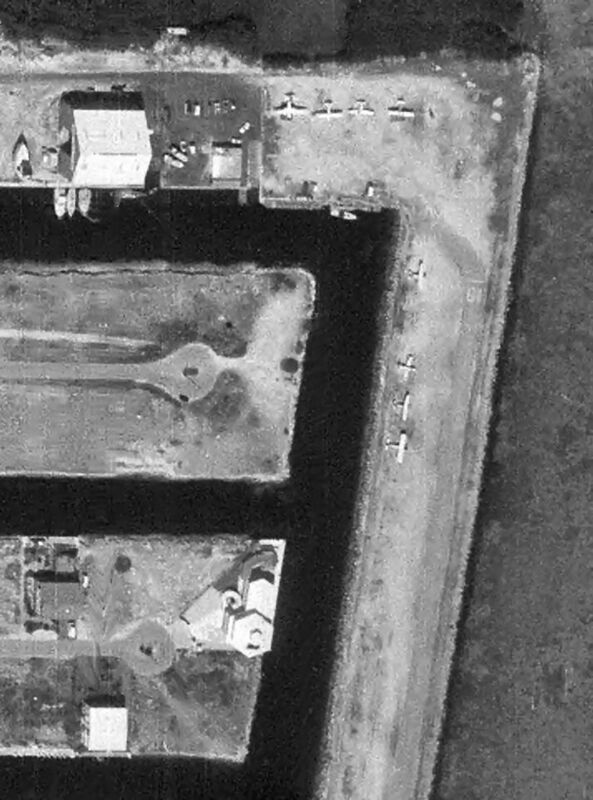 Port Largo Airport, as seen in a February 1973 USGS aerial photo. 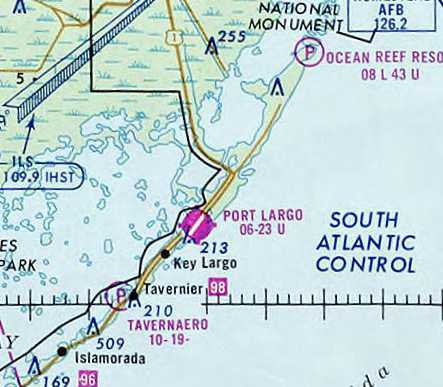 The earliest aeronautical chart depiction which has been located of the Port Largo Airport was on the February 1976 Miami Sectional Chart. It depicted Port Largo as having a 2,300' paved northeast/southwest runway. A 4/1/76 Commutaire International Airways timetable (courtesy of David Henderson). 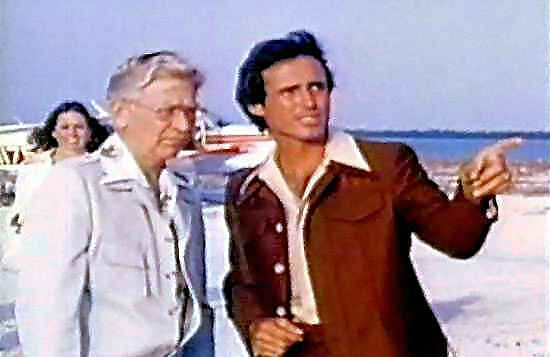 A still from the 1978 Beechcraft promotional film "People Machine" filmed at Port Largo Airport, facing east. 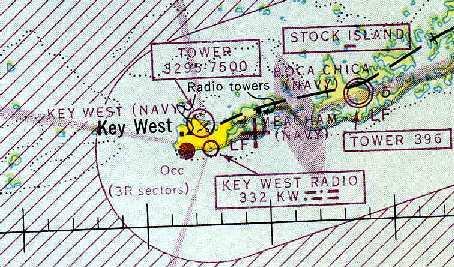 The last aeronautical chart depiction which has been located of the Port Largo Airport was on the Septemer 1980 Miami Sectional Chart. Key West, Marathon, Ocean Reef, and Port Largo. using 9-passenger Britten-Norman Islander equipment. An excerpt from the 12/1/81 Official Airline Guide shows 2 daily flights & a one-way fare of $45. who intended to close the airport & build homes on the site. and even changed zoning laws in an attempt to block residential development. showing 8 light aircraft parked on the northwest of the narrow sliver of airport land. 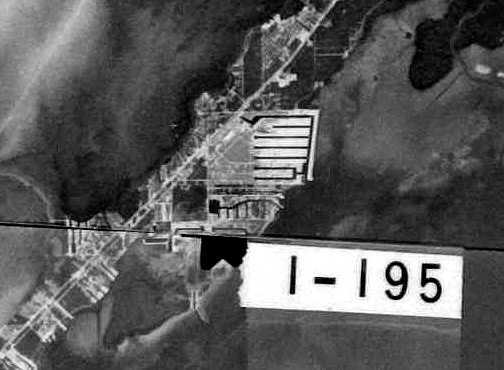 A 1994 USGS aerial view showed houses built over the site of Port Largo Airport. 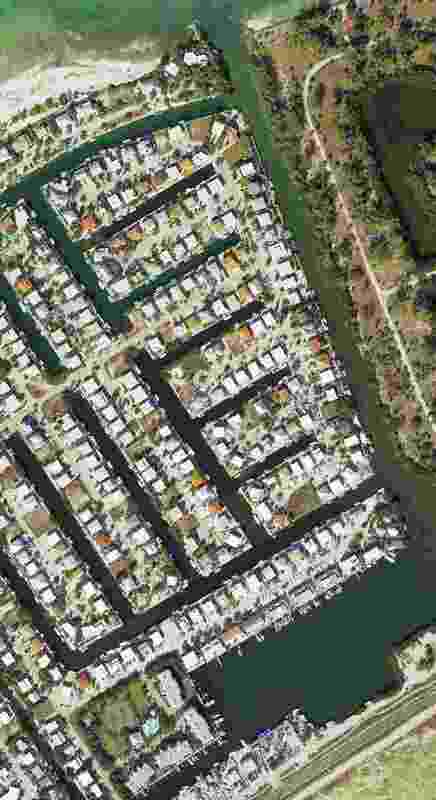 A 12/23/10 aerial photo showed houses covering the site of Port Largo Airport. is now a street called Ocean Cay with high-density oceanfront property. A circa 1917-19 photo of a Navy C-1 blimp at Trumbo Point. 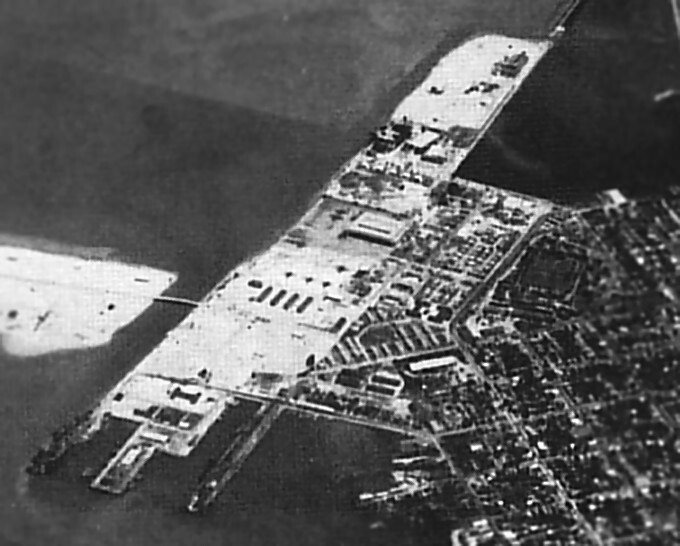 A Naval Air Station was first opened at Trumbo Point in 1917. It hosted patrol flights & conducted preliminary flight training, with 18 seaplanes & 4 kite balloons. 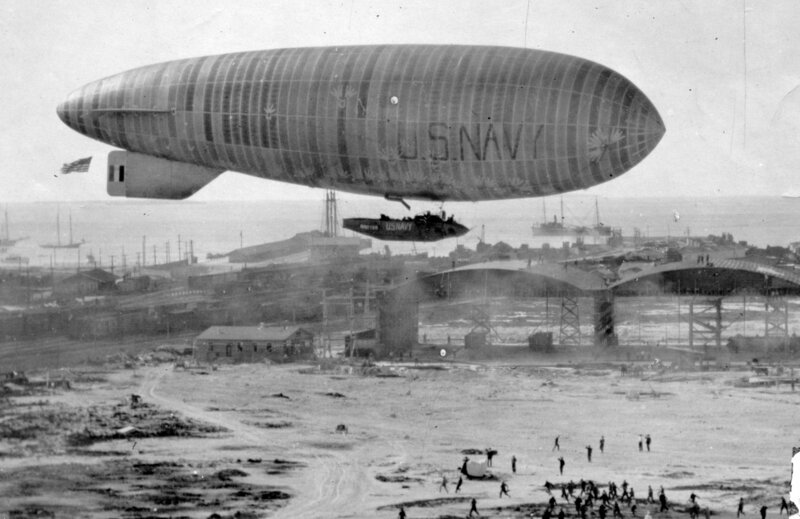 The earliest depiction which has been located of the Trumbo Point Naval Air Station was a circa 1917-19 photo of a Navy blimp (model undetermined). A circa 1917-19 photo of a Navy C-1 blimp over several hangars at Trumbo Point (courtesy of Bill Grasha). In 1919, the first flight to Havana (90 miles over water) departed from Trumbo Point. In the same year, the station's blimp hangar was disassembled & moved to Opa-Locka. The Navy reportedly closed Trumbo Point in 1920. A circa 1923 aerial view depicted over a dozen seaplanes on the ramp & in the water at Trumbo Point. No seaplane facility was depicted at Key West on the December 1935 Miami Sectional Chart(according to Chris Kennedy). was on the April 1937 Miami Sectional Chart (courtesy of Chris Kennedy). Note that it depicted the seaplane base on the western side of the island (which is further to the west of all subsequent depictions). This different location may have been erroneous. with a PBY Catalina flying boat squadron conducting neutrality patrols. 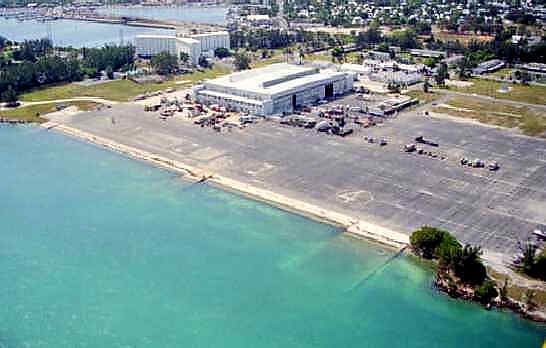 Trumbo Point was commissioned again as Naval Air Station Key West in 1940. The May 1941 Miami Sectional Chart (courtesy of Chris Kennedy). depicted the seaplane base on the northern side of the island, at Trumbo Point. 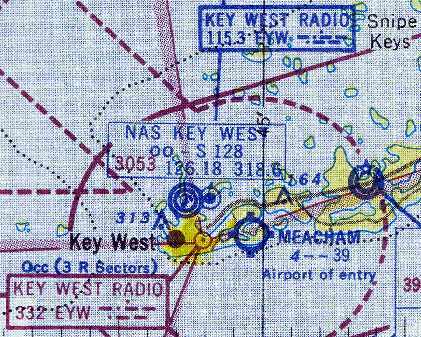 "Key West (Navy)" seaplane base, as depicted on the 1943 Miami Sectional Chart (courtesy of Chris Kennedy). 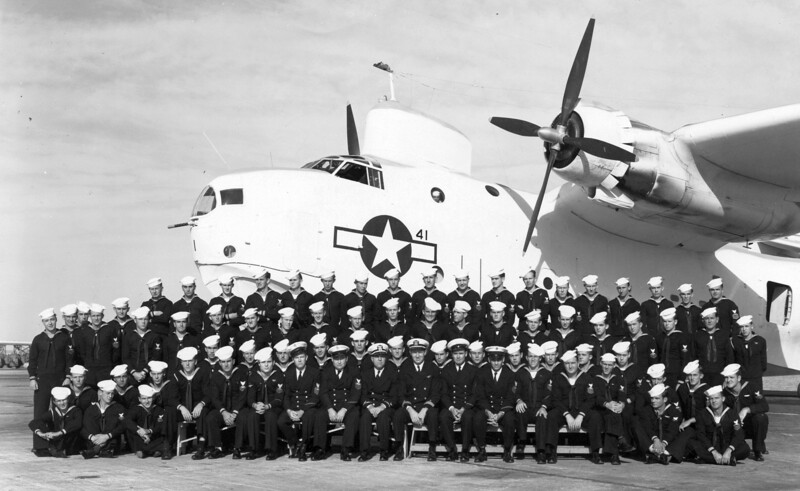 A WW2 photo of squadron members in front of a Martin PBM Mariner flying boat at Trumbo Point. Aircraft based at Trumbo Point during WW2 included the OS2U Kingfisher, PBM Mariner, and J2F Duck. The total complement at Trumbo Point during WW2 was a total of 2,614 personnel. A WW2-era aerial view looking east at Trumbo Point (National Archives photo). 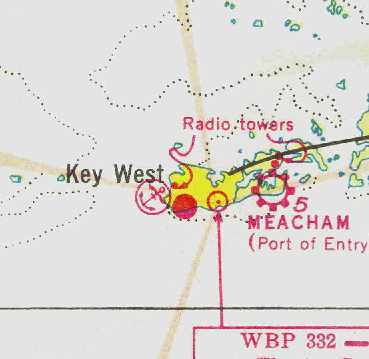 "NAS Key West" was still depicted as a seaplane base on the August 1954 Miami Sectional Chart (courtesy of Chris Kennedy). at which time I was involved in Operation Springboard which was centered there at that time. I was in one of the two P-5 squadrons based in Bermuda. Seaplane operations were discontinued at Trumbo Point at an unknown date after 1961. The aviation facilities were then reused by Navy helicopter squadrons through the late 1960s. which operated the 6 ships of the PHM-1 Pegasus class. A circa 1980s aerial view looking southeast at the Trumbo Point seaplane ramp & hangar. A 1994 USGS aerial photo showed 4 numbered helicopter landing spots painted on the edge of the seaplane ramp. The 1999 USGS aerial photo showed that a cross helipad marking had been added to the northwest corner at the ramp at some point between 1994-99. 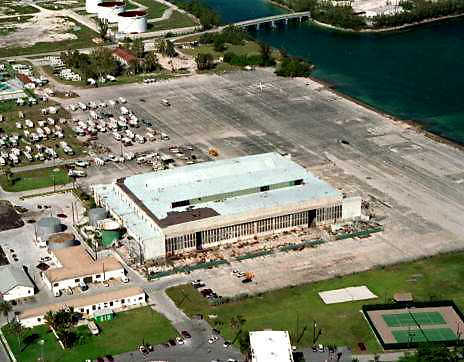 A 1999 aerial view looking west at the Trumbo Point seaplane hangar & apron. 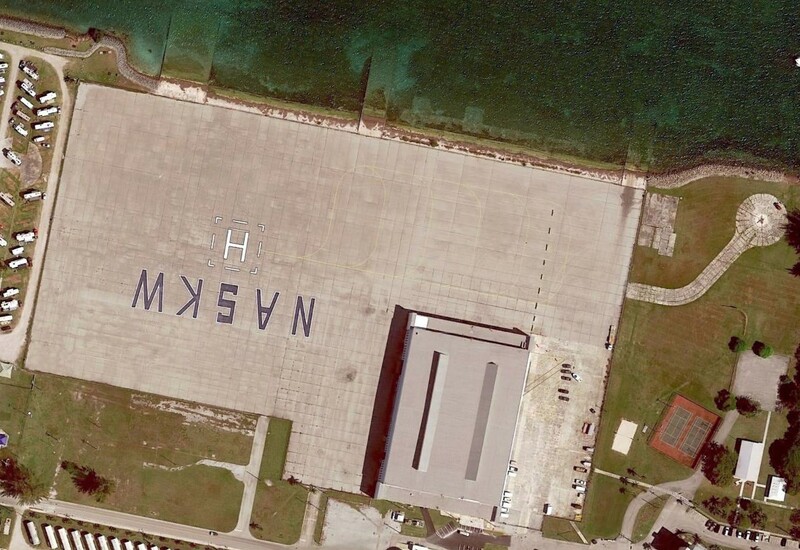 A 2009 aerial photo showed that 2 helipad markings were still visible on the ramp. A 12/28/10 aerial photo showed that the Trumbo Point ramp had been repaved (for what purpose?) at some point between 2009-2010. A 3/18/17 aerial photo showed the Trumbo Point ramp & seaplane hangar remained in good condition. but it has not been determined whether this damage extended to the Trumbo Point facilities.